A stay at Hotel Hungaria City Center places you in the heart of Budapest, walking distance from Erkel Theatre and Locked Up. 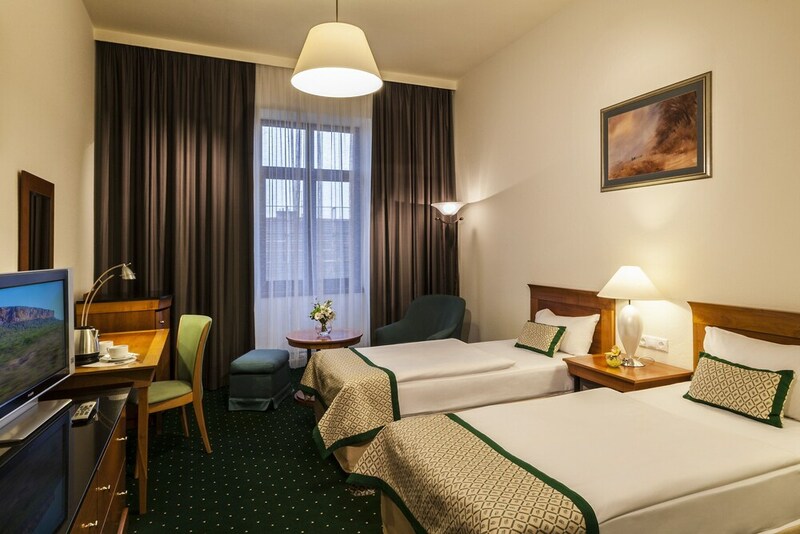 This 4-star hotel is within close proximity of Miksa Roth Memorial House and Claustrophilia. Make yourself at home in one of the 468 air-conditioned rooms featuring refrigerators. Complimentary wireless Internet access is available to keep you connected. Bathrooms have bathtubs and hair dryers. Conveniences include desks, and housekeeping is provided daily. Don&apos;t miss out on recreational opportunities including a spa tub and a sauna. This hotel also features complimentary wireless Internet access, concierge services, and babysitting/childcare (surcharge). Grab a bite at one of the hotel&apos;s 2 restaurants, or stay in and take advantage of room service (during limited hours). Quench your thirst with your favorite drink at a bar/lounge. Buffet breakfasts are available daily for a fee. Featured amenities include a business center, express check-in, and complimentary newspapers in the lobby. A roundtrip airport shuttle is provided for a surcharge (available 24 hours).